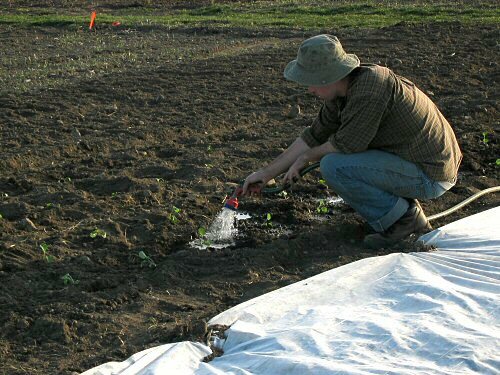 Conall, the all-new organic grower, starting from scratch as our first full-season, full-timer, waters in transplants. Today we set out three more beds of brassicas—so far, there’s cauliflower, broccoli, Brussels sprouts, bok choi—prepared beds for a dozen more crops, set up the irrigation pump for the season, cleaned out the winter storage area of the barn, turned the composting windrow….and more. Still, it’s the rush-to-get-it-in-get-it-done time of the year, and the days never seem long enough (although, they’re getting longer!! ).